Graham Sutherland (1903-1980) was one of the leading British etchers of the pre-1930s period. 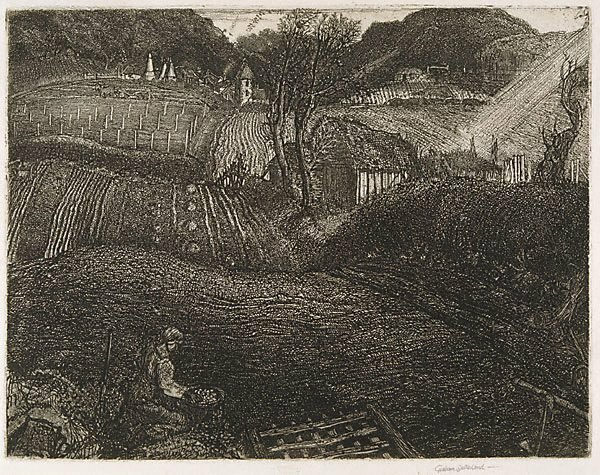 From 1921-1926 he studied at Goldsmith's College School of Art, specialising in etching. In 1925 he met F.L Griggs, whose work he had long admired. Griggs became both an important teacher to the young artist and an influence on his work. This impression of 'The Village' was printed by F.L. Griggs at Dover's House during Sutherland's visit there in November 1926. The rolling, tilled fields, leading to a far-off village seem to pulsate with inner-life. The whiteness of the paper is almost completely obscured by the dense covering of the entire plate with thousands and thousands of tiny black lines. The landscape is based on the countryside around Cudham in Kent. Signed l.r. sheet, pencil "Graham Sutherland" and l.l. image, [incised plate] "GRAHAM SUTHERLAND...". Not dated.